I’ve been working on the “The Princess and the Pea” for what seems like ages but, she’s finally here. 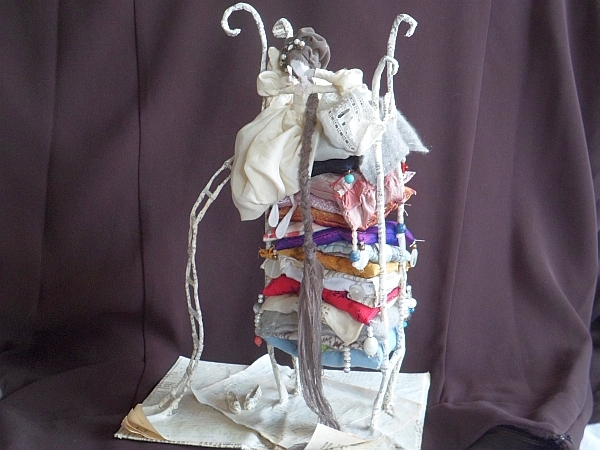 The Princess and the Pea - Papier Mache, Wire and Fabric Sculpture. 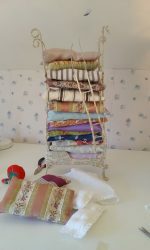 Of course, she’s inspired by the well known Hans Christian Andersen fairy tale “The Princess and the Pea”. In the fairy tale, a young girl is revealed as a princess after claiming to have had a restless night, caused by a pea being placed under the multitude of matresses and featherbeds upon which she slept (the actual number was 20 matresses and 20 featherbeds – I stopped at 15 🙂 ). 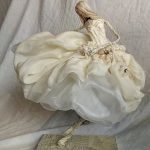 23cm wide, 33cm high and 16cm deep, the piece depicts a small princess wearing a billowing silk nightdress, awakeing from her restless slumber, yawning and streching as morning approaches. The figure is made from wire and papire mache. 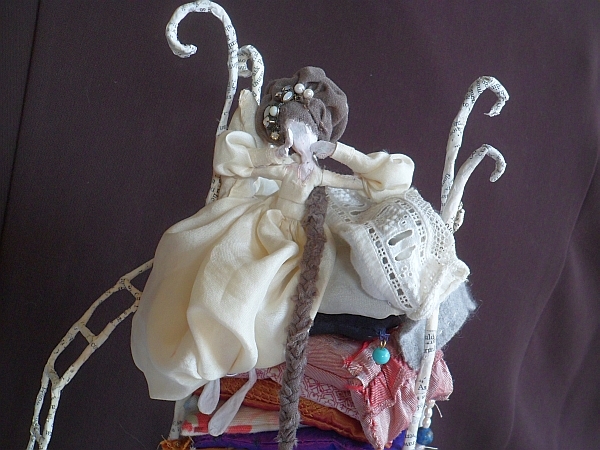 Her hair is made from soft viscose, gathered and ruched, which falls in a lomg plait to the floor. Her nightdress is 100% silk – after all, she is a princess! On the rug are her discarded slippers, patiently made form little pieces of paper. 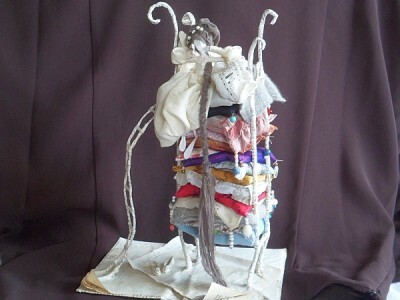 Now to the bed, it’s also made form wire and papier mache and sits atop a book as if coming alive from the story. A ladder sweeps in a curve to the top of the bed. Whilst her mattresses, each one individually handmade, come from all over the world – Indian cottons, Chinese silk and satins, beautiful cottons, linens and 100% cashmere. The sheets under which she lay, like her nightdress are made from 100% silk, overlayed with warm luxurious blankest made form vintage lace and cahmere. The photos shown here, unlike the ones on Etsy, were taken against a dark background. I’m not to sure which I like best, what do you think? To purchase this item, please, visit Our Etsy Shop for further details. How lovely! What a labour of love. Have you seen the Princess and the Pea book by Lauren Child? 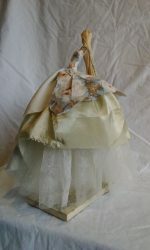 I stumbled on your blog yesterday while looking up images for Julie Arkell. I`m quite new to the whole blog thing and it`s great to find inspiring ones like yours. I love the idea of wordless Wednesdays too! Love your work, so pretty, whimsical and magical. Best wishes.